A nice sunny day (with a chance of rain later). How have your days been? the weather has been playing games here in Southern Cali, I am a little confused about our relationship haha. enie meenie- i couldn't agree more! but i like it because i garden on the sunny days and then the rain does all the work of watering. and i think rain water is always better! I just got back from Portland, where the weather, of course, was cold and rainy, but it was a truly delightful change from the constant warmth of Florida. In New Jersey some people have been seeing snow! We have just had lots of cold rain, but my girls and I can't wait to see the warm sun!!! the weather here (in PA) is not quite so sunny...we've had snow the past 2 days. ugh. those girls are so cute! Adorable!! They are just, too cutie! 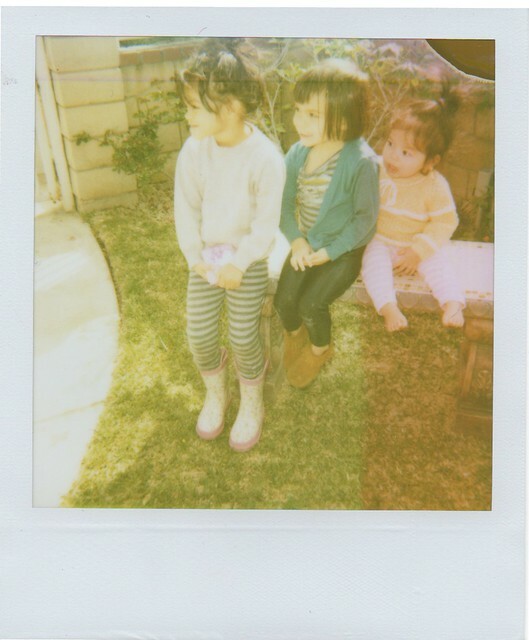 I love Polaroids! It's an unhealthy obsession, really. Oh and the weather here, in Cincy, OH is BIZARRE. We've been having some weird temps here,cold mornings,hot days,then hot mornings and cold nights,etc.It's getting a little annoying. My father just dug up our old Polaroid camera in the garage, and I'm SO excited to use it! The only problem (and I'm sure this is a common one) is that they don't make the film anymore and it is so costly online! Do you have recommendations for where I could find more affordable film? still expensive, but sooo fun!